Contemporary music is happening at Pacific! The Conservatory of Music is proud to host the inaugural New Music Festival organized and curated by 28/78 New Music Ensemble at Pacific. The festival will feature four days of workshops, performances, and musical collaborations between students, faculty, and guest artists. All events are open to public and free to attend. 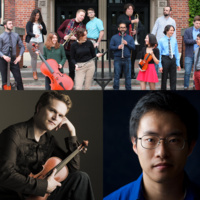 Pacific/Hail at Faye Spanos Concert Hall: Featuring diverse works of music by Pacific faculty, alumni, and students. Augmented Percussion Concert at Faye Spanos Concert Hall: Featuring contemporary works for percussion; an intersection of electronic and acoustic music; curated by Pacific's percussion instructor Michael Downing.